Now in the Reading Room you will find the articles from the JPPF Husserl-Festschrift – Festschrift E. Husserl zum 70. Geburtstag gewidmet. Ergänzungsband zum Jahrbuch für Philosophie und phänomenologische Forschung (1929). Edith Stein, Husserls Phänomenologie und die Philosophie des heiligen Thomas v. Aquino. Versuch einer Gegenüberstellung, pp.315-338. Please go to the Reading Room to download the individual files. In addition, we have also uploaded the first volume of the Masaryk-Festschrift – Festschrift Th. G. Masaryk zum 80. Geburtstage, Erster Teil. Ergänzungsband zur Zeitschrift Der russische Gedanke (1930). Piero Marinetti, L’intelletto e la conoscenza noumenica in Kant, pp. 209-216. This volume has been uploaded as a single file, which you can download by clicking here: Masaryk-Festschrift, Erster Teil. 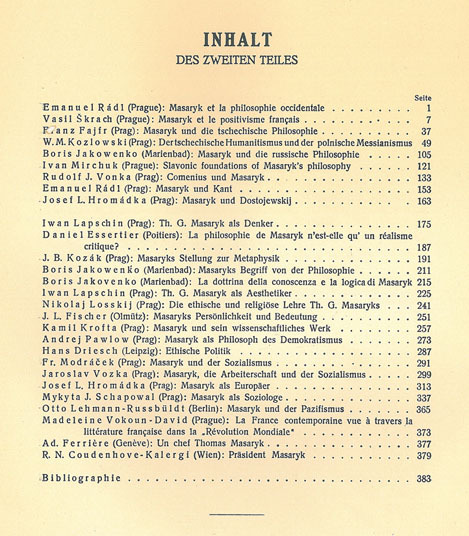 Unfortunately, we do not yet have a copy of the second volume of the Masaryk-Festscrift. However, we do have an image of the table of contents if you are interested. Along with Husserl’s Ideen I, the first volume of the Jahrbuch für Philosophie und phänomenologische Forschung (1913) also contains Alexander Pfänder’s Zur Psychologie der Gesinnungen, Erster Artikel. 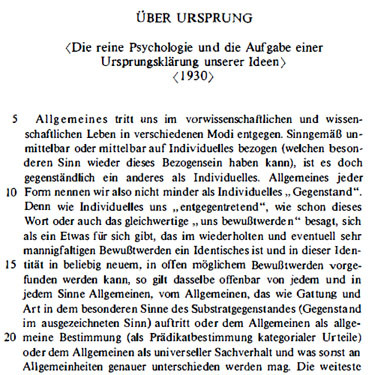 In the ‘Translator’s Introduction’ to Phenomenology of Willing and Motivation, Herbert Spiegelberg remarks that the ‘Psychology of Sentiments’ is easily Pfänder’s “richest phenomenological case study, which I nominate as the next candidate for a complete translation.” Sadly, it has never been translated into English. Next we have posted Moritz Geiger’s Fragment ueber den Begriff des Unbewussten und die psychische Realität from JPPF IV (1921). This brings the total number of pieces by Geiger in our reading room up to 4. From the same issue of the Jahrbuch, we have also included Jean Hering’s Bemerkungen ueber das Wesen, die Wesenheit und die Idee, and Roman Ingarden’s Ueber die Gefahr einer Petitio Principii in der Erkenntnistheorie. Together with his dissertation, Intuition und Intellekt bei Henri Bergson,published in JPPF V (1922), these are the first posts in our Reading Room by Ingarden. Though Husserl famously stated “We are the true Bergsonians” at a meeting of the Göttingen Circle, you will find little mention of the connection between Bergson and the early phenomenologists in Bergson and Phenomenology, ed. Michael Kelly (2010). Finally, I have included Alexandre Koyré’s essay Bemerkungen zu den Zenoischen Paradoxen from JPPF V (1922). This article stems from research on Cantor’s set theory and Russell’s paradox which Koyré had submitted to Husserl and David Hilbert as a draft-dissertation in 1912. (The draft was, however, rejected.) Both the Hering article and this piece by Koyré have been more recently reproduced in Anthologie der realistischen Phänomenologie, ed. Josef Seifert and Cheikh Mbacké Gueye (2009). Along with the piece on Zeno’s Paradoxes, I have added two other short pieces by Koyré, both in English. First is a translation of his essay ‘Réflexions sur le mensonge,’ published as The Political Function of the Modern Lie in the Contemporary Jewish Record VIII (1945). Second is Koyré’s wonderful Introduction to Descartes Philosophical Writings, ed. G.E. Anscombe and Peter Geach (1950). We hope that you put these materials to good use! Now in our Reading Room, you will find a copy of Karl Schuhmann‘s transcription of a number of pages from Daubertania A I 3 – Mappe zur Phänomenologie der Evidenz. This signature contains the notes for an essay Zur Phänomenologie der Evidenz which was to appear in the Festschrift for Alexander Pfänder‘s 60th birthday, along with a number of other excerpts (on each of Edmund Husserl, Aron Gurwitsch, Roman Ingarden, Theodor Celms, Aurel Kolnai, and Philipp Schwarz). Included here are selections by Daubert on Husserl. The ordering of the passages here does not match the order of the pages found in A I 3. For more on this, see Karl Schuhmann and Barry Smith’s article, Against Idealism: Johannes Daubert vs. Husserl’s Ideas I.